Evidence-based guidelines on the therapeutic use of repetitive transcranial magnetic stimulation (rTMS). Lefaucheur JP, André-Obadia N, Antal A, Ayache SS, Baeken C, Benninger DH, Cantello RM, Clin Neurophysiol. 2014 Jun 5. 10.1016/j.clinph.2014.05.021. Cognition-Modulated Frontal Activity in Prediction and Augmentation of Antidepressant Efficacy: A Randomized Controlled Pilot Study. Li CT, Hsieh JC, Huang HH, Chen MH, Juan CH, Tu PC, Lee YC, Wang SJ, Cheng CM, Su TP.Cereb Cortex. 2014 Aug 27. Effectiveness of transcranial magnetic stimulation application in treatment of tinnitus.Yilmaz M, Yener MH, Turgut NF, Aydin F, Altug T.J Craniofac Surg. 2014 Jul;25(4):1315-8. Repetitive transcranial magnetic stimulation over the orbitofrontal cortex for obsessive-compulsive disorder: a double-blind, crossover study. Nauczyciel C, Le Jeune F, Naudet F, Douabin S, Esquevin A, Vérin M, Dondaine T, Robert G, Drapier D1, Millet B.Transl Psychiatry. 2014 Sep 9;4:e436. Transcranial magnetic stimulation in the treatment of substance addiction. Gorelick DA1, Zangen A, George MS.Ann N Y Acad Sci. 2014 Jul 28. Repetitive Transcranial Magnetic Stimulation for Treatment-ResistantDepression: A Systematic Review and Meta-Analysis. 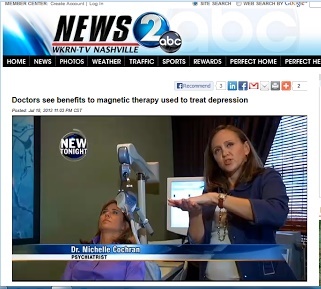 Transcranial Magnetic Stimulation (TMS) has been featured in several prominent news publications highlighting its success in treating depression. Among these publications and television shows are: Dr. Oz, The Daily Buzz, TIME Magazine, PBS Nova, Scientific American, Discover Magazine, The Doctors, and Good Housekeeping. See below for more news stories discussing the latest applications of TMS Therapy. 9/1/2015 Harvard Health: Can brain stimulation aid memory and brain health? 4/29/2015 WebMD: Can Technology Help Treat Depression? 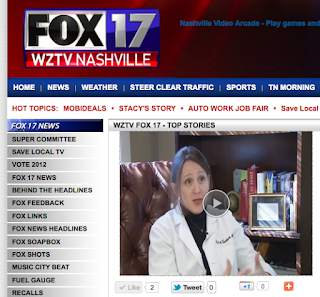 12/15/2014 US News Health: TMS: What Is It and Who Needs It? 12/10/2014 Forbes: Can Altered States of Consciousness Cure Depression? 2/6/2014 Saludify: TMS Therapy - A valid way to treat depression?